Createspace Independent Publishing Platform, 9781539924814, 424pp. Dive into a universe of sci-fi wonders. This collection of sci-fi shorts features a variety of brainy young heroines-girls who engineer, tinker, experiment, and more. Voyage to far-off galaxies with girls who use their science savvy to fix rovers, rescue friends, and protect alien critters. Visit steampunk realms where young ladies put their skills to the test building mechanical wonders and solving mysteries. Trek across sci-fi landscapes with girls who save androids and repair robots. Journey to post-apocalyptic futures where heroines use their tech know-how to bring down overlords and spread the most dangerous thing of all... knowledge. And drop in on a few near-future heroines who use their smarts to take down supervillains and bring a little more understanding into the world. 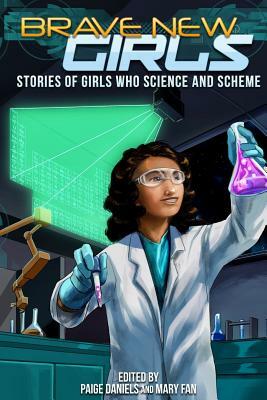 Proceeds from sales of this anthology will be donated to a scholarship fund through the Society of Women Engineers. Let's show today's girls that they, too, can be tomorrow's inventors, programmers, scientists, and more. STORIES BY: T. Eric Bakutis, Elisha Betts, Steph Bennion, Bryna Butler, Margaret Curelas, Paige Daniels, Kay Dominguez, Brandon Draga, George Ebey, Mary Fan, A.A. Jankiewicz, Evangeline Jennings, Jamie Krakover, Jeanne Kramer-Smyth, Stephen Landry, Karissa Laurel, Michelle Leonard, Meg Merriet, Jelani-Akin Parham, Josh Pritchett, Holly Schofield, and Lisa Toohey. Featuring artwork by Hazel Butler, Sonya Craig, Ken Dawson, Evelinn Enoksen, Ben Falco, Kathy Ferrell, Christopher Godsoe, Evangeline Jennings, Deanna Laver, Jennifer L. Lopez, Jelani Akin Parham, Josh Pritchett, Emily Smith, and Jennifer Stolzer.